Born in Milan, Bice, now a sprawling Italian food empire, conquers a corner at Crescent Court. Whatever its back story—and, rest assured, there is a quaint, colorful tale here—Bice scores points for bringing good, authentic Italian food to Dallas. We need that. Only a couple of local places operate at its level in terms of the kinds of dishes. Il Mulino and Daniele Osteria come to mind. Forget the red sauce; think of brightly embellished seafood and housemade pastas. Given Bice’s location and charisma, it’ll help spread the word of real Italian food, and hats off to that. Permit me also to take this opportunity to give a personal shout-out to Bice’s butternut squash crêpes. I do this because, as unbelievably lush and delectable as the butternut squash crêpes are, they are an offbeat dish. Offbeat rarely survives in Dallas, which is a tragedy. For that reason, butternut squash crêpes, I salute you. As for Bice’s history, it originated in 1926, when Beatrice “Bice” Ruggeri opened a trattoria in Milan. By 1987, her son Roberto had expanded to New York, with a site designed by Adam Tihany. It is now officially a chain. According to the web site, there are 25 restaurants in the Bice group, in cities as far-flung as Dubai and Marbella, with another wave opening globally in 2006. Some have also opened and closed, including branches in Los Angeles, San Diego, and Scottsdale. Beatrice’s grandson Raffaele is in charge of developing new locations. If you care to get a gander at his curly black hair and piercing blue eyes, he’s in Dallas every other week. He oversaw the construction, which follows the Bice template, with leather banquettes in the dining room, tidy canvas-covered seats in the bar, and the trademark floor made of richly colored inlaid woods. The menu’s in sections: appetizers, pastas, fish, and meat. The best route: stick to antipasti, salads, and pastas. Seafood was okay, but “carne” was the weakest section, bogged down by pedestrian veal dishes that seemed to cater to American tastes. That said, the osso buco with saffron risotto was nothing to sneeze at, with strands of meat sliding cooperatively from the bone and a miniature spoon rising to capture the marrow. Antipasti was all about cured meats paired with fruits or vegetables: prosciutto with melon, bresaola with arugula, and the like. The standout was tuna tartare with avocado and celery root, a combination that felt fresh. Everyone gets calamari, and Bice’s version satisfied, with its crisp batter and its inclusion of the occasional spear of fried zucchini. Order drinks at the bar, and you get free servings. And praise Bice for its salads, with specialty greens such as arugula, radicchio, and Belgian endive. All three were combined in the tricolore, a standard Italian salad whose dressing here seemed pale. Better options included Belgian endive with walnuts and Gorgonzola, and arugula salad with thin, crisp almond slices and pressed ricotta cheese. If you do nothing, do get pasta, for this was Bice at its best. It’s house-made, then paired with soulful ingredients, such as ravioli with tender beef short ribs, spinach, and veal. Fettuccine married well with lobster and cherry tomatoes in a subtle lemon sauce. Gnocchi in Gorgonzola cream was soft and comforting, the potato dumplings very delicate, but it was jazzed up with a novel twist—bits of sweet pear. And, yes, the butternut squash crêpes: two puffy turnovers, paper-thin pancakes enclosing clouds of sweet, golden squash purée, offset by a savory sauce flavored with leek and thyme. “I’ve never served this dish,” the server said. Okay, it’s not for everyone, but surely someone out there must love butternut squash. 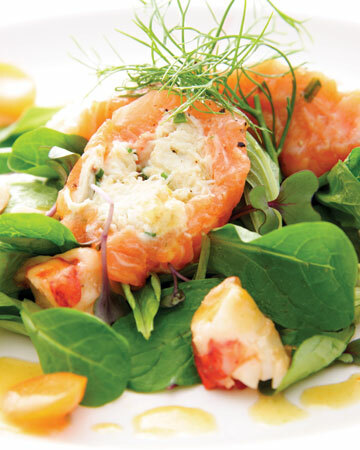 Seafood was much like the antipasti, simply prepared, with an emphasis on the ingredients. Atlantic cod seared in brown butter flaked nicely, but the same couldn’t be said for tuna steak, whose strings of fat were less than ideal. Oddly, we were told that the tuna was grilled, but its sesame crust seemed awfully perfect to have withstood a session over an open flame. Among desserts, the miniature cannoli bested the rest, thanks to its generous ratio of crust to ricotta-cheese filling, beating out an awkward berry tart and a ho-hum lava cake. Managing the place is Brian Perry, whom diners may recognize from The Palm, where he worked for nearly 20 years. Much of the opening staff, including servers and chefs, was imported from Italy to see the restaurant through its early days. But those guys will probably return home once everything’s shipshape. Pray they leave the butternut squash crêpes behind. Update: Arcodoro Pomodoro has moved into the space formerly occupied by Bice.